There are so many words and sentences we don’t perceive as harmful, damaging, or plain painful – yet for children, they are. 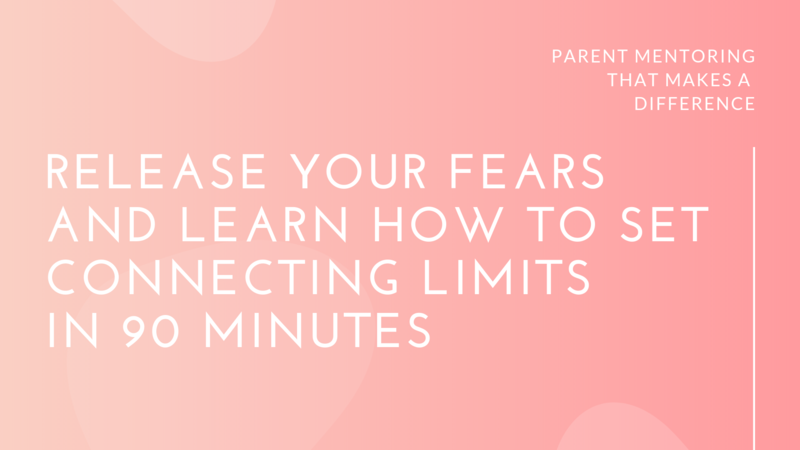 The below is a list of things you should never say to your child if you want to maintain a strong connection and the sense of empowerment. I meet so many wonderful and good-aiming parents through my parent coaching program, who are simply not aware of the consequences their words have on their children, and upon their relationship with them. No one has yet to tell them that children communicate from the heart, not from the brain. This is something that we, adults, do. Kids, however, work differently. Since children’s brains are not yet fully developed, they can’t analyze, evaluate or judge the words they are told. Instead – they just feel them. A practice that we, adults, have long gone abandoned since we are literally lost in our brainy world of analysis, evaluation and judgment. If you want a glimpse into the way children see the world, and get a chance to challenge your brain to observe without evaluation, follow the link. 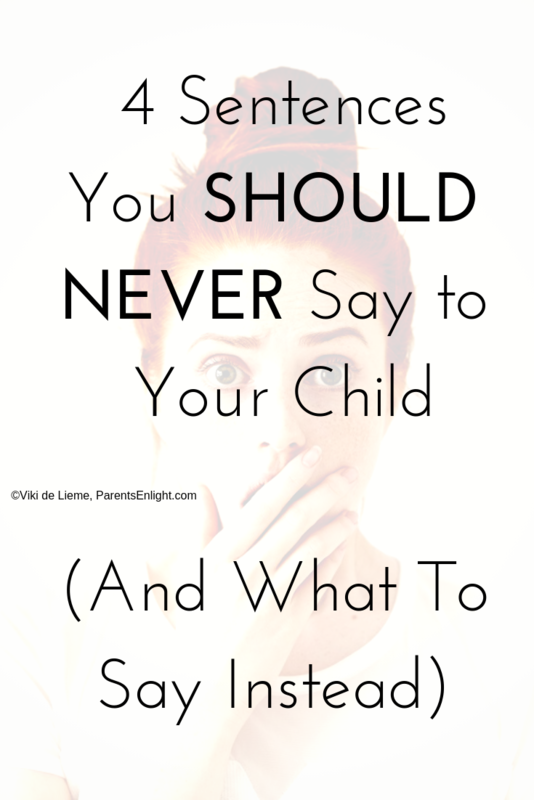 If you want to know which things you should never say to your child – read on. 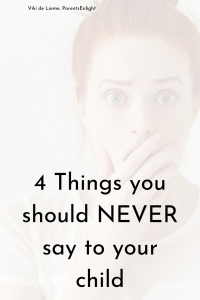 The following is a list of things you should never say to your child, and a full reasoning and explanations. Whether you say these every now and then, or whether you’ve chosen these for your leading parenting strategy – today is a great day to rethink, and start parenting differently. All parents do this. Peaceful and less peaceful. Mindful and less mindful. This is just one of those things that parents say because everyone says it; but not too many stop to consider what really happens in your child’s brain when you gain her cooperation following the threat of leaving her. A little girl is having the time of her life in the Gymboree. She’s rolling around, tossing her little body around the playscape, giggling; she’s just shy of two. Her dad is less excited. Every minute passing forces his patience beyond his smiling limits. Sure, he’s had a rough day, he’s tired; he needs to rest. A few more minutes pass and he declares “common honey, we’re leaving”. The little one is in her own world of fun and games. She might have heard him, or maybe she didn’t. He repeats the same phrase, but this time his tone is harsh. She looks up and says “no, daddy, no”. He smiles at her and replies “ok, so daddy is leaving”. She looks up again and repeats “no, daddy, no”. This time her voice is shaking. “As you wish love” he says, as he starts packing their bags. She begins to silently cry, still sitting put. “No, daddy, no”. He doesn’t look at her; he puts on his shoes and takes his first steps out of the little playroom. Her cry intensifies. “No, daddy, no”. He takes a few more steps, further and further away, when she finally pulls her little body up and follows him. Bowling in tears. Completely unaware, he led to the clash of the titans. The little one’s two most primal, most basic needs, protection and freedom, clash one into the other like storming rain clouds. Her need for freedom, governed by her almighty soul, was demanding to get its way. Her need for protection, governed by her brain’s survival instinct, screamed “run for your life. You’re too small to survive without him”. Each time a parent gains his child cooperation using this threat, he triggers the child’s survival instinct and damages the connection. “You are such a good girl!”; “You are mommy’s little helper”!, or “You’re a bad-bad boy”! “You are spoiled/entitled/sassy/naughty” or whatever you can think of. If you start a sentence with “you” followed by a noun and an adjective, what you are saying is a label. “Positive” labels are as damaging as “negative” labels, because children only have two possible reactions to being labeled: they can either accept the label and do whatever they can to “live up to it”, or reject the label and do whatever they can to prove us, parents, wrong. Either way – they are controlled by the label. Either way – the label robs children of some of their autonomy and free choice. Children are attuned to their needs and feelings in ways that adults (unless super mindful) can’t ever be. Children do everything that they do to get their needs met. When a child does something pleasant (bring us a cup of water, share something with a friend or a sibling, etc) she does it to meet her own needs. Her motivation is pure, mindful, and connected – she truly wants to make us/friend/sibling happy. If, following that deed, she is labeled her as a “good girl”, her brain perceives this compliment as gratification for what she has done, instead of simply enjoying the gratification of having her needs for connection met. Her inner motivation will shift to external motivation as she will expect your compliment following the deed. This has following implications: what happens if this time you won’t be there to compliment? Should she do it or should she not? Knowing you deem this behavior “positive” she might choose not to do it to prove to you that she is not the good girl you claim her to be. 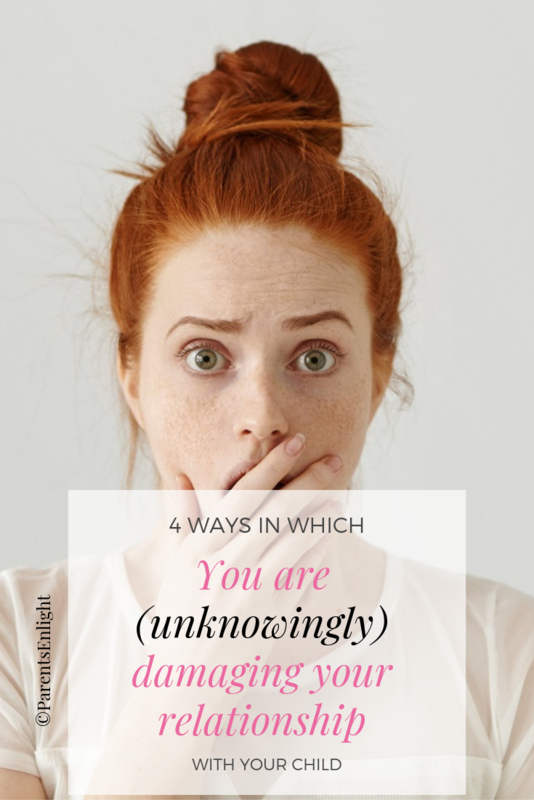 This might sound weird to you, but when the connection loosens, for whichever reason, and might happen a few times each day – she would not want to please you in her behavior. This is not a thought process, all this happens in her heart and directly translates into behavior. What was once a pure need to make those she is connected to happy, is now messed up due to the label. Everything that we call “behavior” is the very last link in the life experience of a child. Prior to it there is always a feeling, and prior to it there’s a need. Met needs call for pleasant feelings that call for pleasant behaviors. Unmet needs summon unpleasant feelings that surface as unpleasant behaviors. When we try to “discipline” children addressing nothing but their behavior – thus labeling them – we intervene with their inner mechanisms and switch internal motivations to external motivations. Always speak about the deed – never about the child. Instead of saying “you are a good girl!” say “bringing me a glass of water was very thoughtful of you. Knowing that you care for me makes me happy” or “choosing to share that toy was very graceful of you – you made Timmy very happy!” Speaking about the deed gets us two wins: it validates the child’s inner motivations and helps her meet the need she aimed for when doing the deed, increasing the chances that next time she will choose to do the same thing. But she will choose it. In case of unpleasant behaviors – always address the need, rather than the behavior. Children (like adults) hurt when they are hurting. Instead of saying “you are a bad boy” say “wow! You are really angry, aren’t you”? This reaction addresses the child’s needs and will (almost) always stop the unpleasant behavior without labeling the child. Read the linked article for a more detailed explanation on using this tactic to handle tantrums. “Say that you are sorry” and “say thank you” are the best examples as these sentences directly have to do with the child’s emotions – when we “order” the reaction, we interfere with nature inner motivations (again). If the child doesn’t feel sorry for what she had done, ordering her to say sorry might only lead to resentment. If she isn’t thankful for what she had received, ordering her to say “thank you” is nothing but paying lip service. If you want to teach your child to be thankful, be thankful – for absolutely everything done for you. This teaches your child that it’s not the object that matters, but the intent. Only then you can say “aunt Mimi gave this present a lot of thought. She wanted to make you happy. Would you like to thank her”? If you want to teach your child to apologize after hurting someone’s feelings – don’t be afraid to apologize yourself. And only then, Instead of saying “say sorry”, say “snatching Timmy’s toy made Timmy sad, look at his face – can you see how he is feeling? Would you like to apologize”? If you want to know how to teach your child respect, read the linked article. Be the change you wish to see. Model. Model. Model. Children’s emotions are real. They have a reason. If she is crying – something happened (even if you don’t think it’s that bad). Children’s words are real – if they said it – they meant it. Validate feelings. Words are windows to our children’s souls, explore them with true curiosity. These four things you should never say to your child are just the first on the list of harmful saying, yet I chose to begin with these since they are the most damaging of them all as they intervene with children’s inner motivations and distance them from their needs and their feelings. When we imagine the adults our children will be in just a few years from now, we see confident individuals, who know what they want and truly believe they can achieve it. We see bright adults who are attuned to their needs and feelings, and by virtue – are attuned to the needs and feelings of others. Being mindful of our words is the only method to raising the adults we want our children to be.